It’s official—we’re moving. Over the Christmas holiday we learned that Michael has a new job in the DC metro area, and now we’re in the midst of selling a home and looking for another. I’m excited about returning to that area and I think it will be very good for our family, but right now it is a *lot of work* and I don’t see that changing much in the next few months. Frankly cooking is not very high on the priority list at the moment, not when the house has to be kept immaculate for potential buyers to come visit. Oh, and our three little boys need some attention every now and then (every two or three minutes). I never really gave this much thought until now, but all of this prepping to show the house has made me realize that I often make a real mess in the kitchen. I mean, some days it looks like a kitchen bomb went off. For example, I made blueberry pancakes for breakfast, and it took an hour to get the kitchen and breakfast area back to semi-spotless condition. Any meal requires complete cleanup after so that we aren’t running around at the last minute when we need to show the house. It really puts a damper on my creative cooking spirit! Fortunately, we have some meals put back in the freezer that I can pop into the oven or microwave to warm up, and that way I don’t have to make too much of a mess, but we do not have an endless supply of those prepped meals. I’m going to have to cook sometime, and the kitchen will get messy as usual. So I think it’s time to break out some slow-cooker meals that will help alleviate some of the stress. My philosophy about slow cooker food is very simple: I think it should taste just as good as when you cook the food on the stove top. This means taking a few extra steps at the beginning, then letting the slow cooker do the rest of the work. I realize that this is contrary to many slow cooker recipes, which often have you dump everything into the pot with almost no prep work. And truthfully you could do the same with this recipe and still have a fairly good tasting meal, but it works best if you saute the meat first and deglaze the pan with a nice wine, then add the meat and reduced wine sauce to the slow cooker. To me, that makes all the difference between a soup that is pretty good and a soup that is memorable (and still relatively easy). For a weeknight meal, you can actually make this the evening before and let it cook all night, then transfer the soup to the refrigerator in the morning and just reheat it when you get home. Chunks of crusty bread go great with this and soak up the broth nicely. 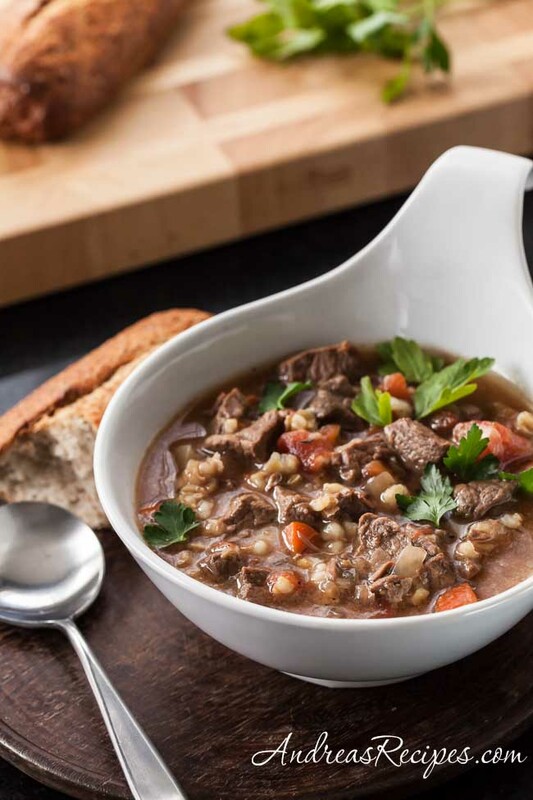 This beef barley soup recipe is my contribution to January’s installment of Waiter There’s Something In My… (WTSIM), an event sponsored by Andrew of Spittoon Extra. This month’s theme is stew, and although this recipe is called soup, I think it crosses the line into the stew category. Besides, there is a lot of gray area between the definitions of soup and stew in my opinion. Adapted from The America’s Test Kitchen Family Cookbook. Dry the beef pieces with some paper towels, and then season with salt and pepper. Heat 2 teaspoons of oil in the large skillet over medium-high heat. Brown half of the beef, then add to the slow cooker. Repeat with the remaining beef. Add 2 teaspoons of oil to the large skillet and saute the onions and carrots with 1/4 teaspoon of salt. Cook until the vegetables are soft, about 5 minutes. Stir in the wine, scraping up the brown bits (fond). Simmer until the wine is reduced by half, about 1 minute. Pour it all into the slow cooker. Add the tomatoes and juice, beef and chicken broth, thyme, and pearl barley and cover. Cook until the beef is tender, about 6 to 7 hours on low or 4 to 5 hours on high. Add the fresh parsley and serve. You can also make this the night before, then refrigerate until dinner and rewarm. Good luck with selling your house. I am glad I am not the only one whose kitchen sometimes looks like a disaster after cooking. Thank you, we’re hoping that the slower housing market doesn’t bite us too badly! that looks and sounds great. i love your chicken masala too. Thanks, Jacob. I’m glad you liked it! A stew or a soup? Who cares when it sounds and looks so delicious! 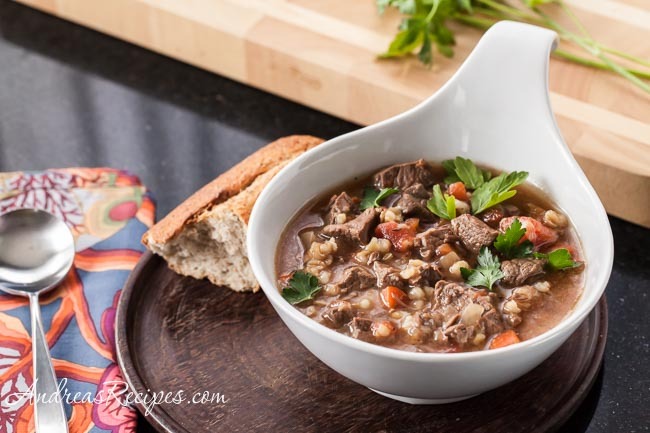 I found your recipe by googling “beef barley soup blog.” I’m not big on the commercial recipe sites, so usually find recipes (and great blog sites) in this way. I don’t make many recipes with beef involved, but my husband likes it from time to time. I do have very fond memories of my father’s Saturday soups and beef barley was one of his best efforts. And, after all these years, I just found out it is my husband’s favorite soup–a detail he’s kept back because he knows beef isn’t my thing…how sweet. Also, on his behalf, I purchased a large sampler pack of grass fed beef from a farmer at the local market last fall and we are still working our way through it. Grass fed beef is very lean and so I am–by trial and error–learning how to prepare it. This recipe in the slow cooker seems just right; and I did just check to find that there is a chuck roast in the sampler pack. I made this soup exactly the way the recipe called for and it was absolutely delicious! I am going to send it to my brother who asked for the recipe when I told him how good it was. Thanks! First time visitor. And first recipe in my slow-cooker. It was really fantastic. Like the wine! Wow, just came home with my new slow cooker. Had one 25 years ago and loved it, now I am again attempting to make life easier and eat healthier meals. I was hoping to make a beef and barley soup as my first test of this appliance and was fortunate to find your recipe. I agree that prep of foods is the difference between a decent meal and a memorable meal. Thanks so much for the recipe. I am trying to throw away my conventional kitchen, purchased a convection toaster oven and the slow cooker. I am expecting that they both will make life easier as I can cook my meals while I sleep and not heat up the house when i want to roast something…it is awful to me to want a roasted chicken when the weather is 95 outside. Thanks for your support of my ” living without a conventional kitchen” and the knowledge that a good meal is possible, I am so inspired. So I tried out your recipe, thanks for sharing! It’s pretty good, though I ignored most of the quantities listed and just “did my own thing”. After 12 hours, and perhaps not enough water/bouillon, I have an amazing stew (whoops, I was trying for soup). I agree with you that the touch of wine makes all the difference! Perhaps it seems silly to make it in the summer, but this stew hit the spot. YUM!